On the surface, developer Night Light Interactive's 2D puzzler looked to be right up my alley. But as dug deeper into the relatively short game, I noticed shortcomings that kept the game from reaching its true potential. Whispering Willows tells the tale of a Elena, a young girl who is searching for her missing father. Using a unique amulet that allows her to enter a spirit realm she begins her search. The story was intriguing enough to keep me engaged during the first half of game but the uninteresting character development eventually made me lose interest. While in the spirit realm, Elena can see and interact with dead spirits lurking around the area. This should be a good way to learn more about the events that led to Elena's current predicament but it is mainly used as guidance on where to go next. Unfortunately most spirits didn't really have much to say with the exception of a few. To get a better understanding of the game you must find the notes that are scattered around the world. These notes do a better job expanding the story and explaining things than any other part of the game. Aesthetically, Whispering Willows shines. Wortham Willow's collapsing mansion and its surroundings are presented in a beautiful, hand drawn art style that I really appreciated. The score is immersive as well. Each area's music does a superb job of complimenting the eerie tone of the game. Things such as hearing a door creak, listening to hard roar of the wind, or the sound of distant footsteps added to an already uncomfortable atmosphere. The game's puzzles are very simple and require next to no thought at all. Most of them are solved by Elena going into the spirit realm and moving a stationary item, like a bookshelf or desk. This usually opens up a path for her human counterpart to progress further. I feel the lack of challenge and variety in the puzzles is the game's most disappointing aspect. At no time was I even remotely stuck on the games puzzles. Elena's ability to enter the spirit realm is underused. I would have loved to see more innovative ways to use such power. This inevitably leads to repetitive gameplay that gets old after the first hour. 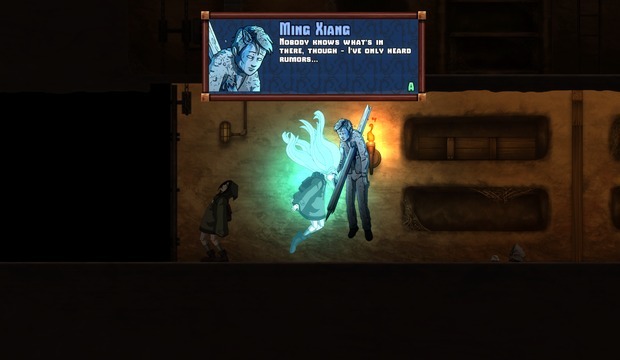 Whispering Willows has some pretty interesting ideas but most of them are never truly realized. The setting and soundwork does a good job of making the world feel immersive but the lack of challenging puzzles and the repetitive gameplay leads to a forgettable experience. Oxenfree has its flaws, but the story will keep you engaged until the very end and the charismatic cast of characters, coupled with the visually stunning environments, makes this adventure worth playing. Facepalm Games has created a fantastic puzzle-platformer and coupled it with a story that not only delivers but makes the player questions their own morals even after the credits roll. This is the type of absorbing experience that great games are build upon. Never Alone never has that transcendental moment where the player can momentarily look past the game and see the world of the Inupiat. Instead, that world feels burdened with the task of being the appealing kernel of a heavily flawed machine. There's a land of wondrous play and exploration somewhere in this premise, but Never Alone isn't it. When I first started playing Whispering Willows, I was somewhat turned off by it. Truth be told, if I hadn’t been reviewing it, I would have probably quit. I didn’t though, and I found most of the game to be a rewarding experience. It would have benefitted from quicker movement through most of its areas, and perhaps a little more challenge to its puzzles. Despite these issues though, its characters, scenery, and atmosphere are good enough to carry the game. Fortified is certainly an enjoyable game to play. The lack of variety and somewhat cliche story isn't necessarily going to grab you, but the lighthearted tone of the game coupled with its entertaining wave-based combat makes for an pretty solid title.